Mosaic Art Now is an organization dedicated to the promotion, understanding and appreciation of contemporary mosaic art. They maintain a lively web presence and produce a series of publications to meet those ends. Without fail, they deliver provocative and inspirational content for artists, aficionados, curators, architects, designers, collectors and educators. They are also an organization very near and dear to my heart. Every year, Mosaic Art Now publishes an annual exhibition in print called, fittingly enough, Mosaic Art Now. The 2010 issue is currently in production and will be available in mid-February of this year. The 2010 edition promises to be nearly double the size of last year's 76 pages and for the first time in MAN's history, will feature the results of their juried, international Best in Show competition. The call for entries went out in August, 2009 and 301 artists from 25 countries submitted their art for consideration. The competition was curated by Scott Shields, PhD; the chief curator of the Crocker Art Museum in Sacramento, CA. Shields evaluated the 525 individual works of art submitted and selected the 18 finalists whose work will appear in the juries section of MAN's 2010 exhibition in print. Out of those 18, Shields awarded the title Best in Show to artist Ellen Blakeley for her three-dimensional piece "Meredith." 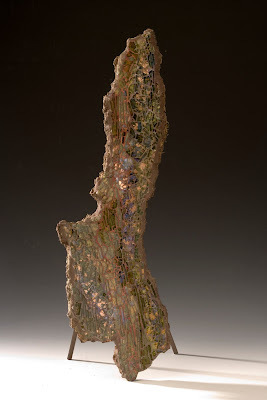 For "Meredith," Blakely attached shattered safety glass to a section of live oak bark. She used various surface treatments on the work to achieve the subtle, soothing effect shown here. Blakeley celebrates the natural, earthy essence of her substrate without disguising it. In treating her materials with a quiet respect, she elevates and enhances what would have been discarded under ordinary circumstances. "Meredith" reminds me that every day, I'm surrounded by miraculous and beautiful objects and all I have to do it pay attention to see them. Brava! If you're interested in the world of contemporary fine art mosaic I encourage you to pre-order a copy of MAN's 2010 annual publication now in anticipation of its 18 February release. I will post more information as soon as it hits the stands. Buy one for the art of course and as a bonus you'll get a feature story written by yours truly. In the meantime, the previous editions of MAN's art annual and their other publications are available now through their website. You can also follow the regularly updated MAN blog and Facebook fan page.